With a Side of Rice – Page 2 – Whole foods, most of the time. Happy Friday and hooray for a bonus post! The other night for dinner, I wanted something light and fresh. Summer fare for me should be light and fresh. Would you agree? I never follow my own rules, but anyway. Hah! Fish and veggies are a good light meal. Normally I would even suggest grilling the fish *and* the veggies, but our grill is in sad shape and anyway the gas was empty. So, sheet pan dinner it was. I hate heating up the oven when it’s hot, but it wasn’t like I was going to be cooking for hours, so it wasn’t that bad. Not counting the fish thawing time, this meal came together in under 30 minutes. I cooked everything on a cooking sheet with foil for 15 minutes at 425 degrees. The best part about it was probably the glaze that I made. What’s not to love about butter and olive oil and lemon juice? Whisk all ingredients together and pour/brush over fish and vegetables arranged on foil covered cooking sheet. Bake for 15 minutes at 425 degrees. I really never know how to begin blog posts. It’s not a letter or an email, but it feels like it needs an introduction of sorts. Yeah yeah, I’ve got an English degree, I probably should know these things. But I don’t. It’s just weird. I don’t want to be too informal, but I don’t want to say “hello and welcome” every single time either. I’ll figure it out. Eventually. Meanwhile, I haven’t been cooking all that much recently either (as I believe I said in my last post) but today I went major (and I do mean MAJOR) grocery shopping so here’s to some awesome experimenting in the kitchen in the next month! But hey, I made The World’s Best Black Beans yesterday. They were so good I almost ate all of them in one meal. Well not quite. But they were really that good. Also here’s my concise review for White Claw Hard Seltzer: It’s low calorie, low carb, and tastes like Skittles. I love all the flavors. Give it a try if you’re into that sort of thing; it’s a great refreshing beverage for the summer, especially if you’re not into beer! Pour beans into a small pot on the stove and heat over medium heat, stirring to ensure even heat. Add garlic, red pepper flakes, salt, and pepper, and mix thoroughly. Remove from heat and add lime juice, lime zest, and cumin if using. Serve immediately, preferably in tacos, but would also be delicious over rice and topped with chopped cilantro. It’s summer!! Time for swimming, baseball, fireworks, gardening, and all that jazz! Admittedly, not my favorite season, because I’m not a fan of hot weather, but I really really love the whole concept of al fresco eating, or eating outdoors. It’s fun to grill everything, and I do mean everything. A friend recently suggested I try grilling romaine, which I can’t wait to do. It’s on my list. I’ll probably blog about it. Anyway, one of my favorite foods in all the world is wild caught salmon. This is something that even just a few years ago, I really never thought I would say. If I’m being really honest, I hated almost all seafood for most of my life, with the exception of canned tuna and some sushi. And salmon just topped the list of fish I thought I hated. It’s weird. But now it’s kind of my favorite and I could eat it every day. So. Grilled salmon. I haven’t actually made it yet this summer, so this is more of a wishful thinking post, but once I go grocery shopping again, I’ll be grilling some salmon, romaine, and probably peaches with cinnamon because that’s another thing that rocks my socks. And we’ll eat al fresco while listening to the Brewers lose games they should easily have won, like Sunday against the Cards or yesterday against the Royals. <– That one really made me mad. Throwing one over on my man Hader isn’t nice. What’s your favorite grilled summer food? Tell me in the comments here or on Facebook and if you include a recipe, I might even give it a try! My sister visited me last week and we spent most of our time eating popcorn at the movie theater because we went three times (twice to the same movie but who’s counting) so I didn’t cook much. We ate a lot of pizza too. So I do not have a new recipe for you this week, but I had another idea! I’m going to occasionally do cookbook reviews, starting with some older ones that I love and use often. Of course, because I’m a nerd, one of my favorite cookbooks is The Unofficial Harry Potter Cookbook. This cookbook is eight years old already but it’s also probably my most used of the myriad that I own. This has everything to do with it being Harry Potter related, obviously. There is no recipe for Butterbeer in here, but there are so many other delicious recipes, along with random fun facts and even instructions on how to brew a proper British cuppa. 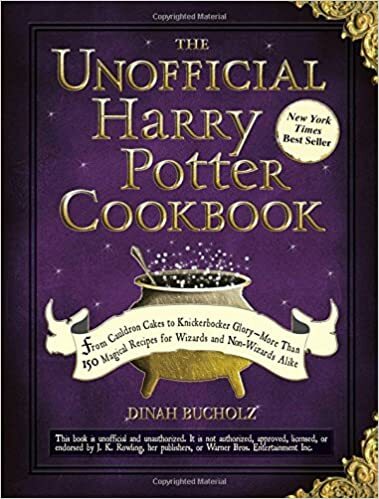 My go-to recipe in here is the Creamy Onion Soup, which is a Weasley house recipe. It’s simple and honestly amazing on a cold day with some crusty bread. But this book also has go-to worthy recipes for roast chicken, pork chops, and even an apple pie recipe. It is listed as juvenile nonfiction, but don’t let that stop you. Some of these recipes are complicated and a fun challenge. There’s even a recipe for haggis, but it’s not exactly recommended that you make it! I’ve loved every single recipe that I have made from this book, and I have only covered about half of what’s in it. It’s a wonderful addition to my collection, and if you are a Harry Potter fan and a cooking enthusiast, it would be a wonderful addition to yours, as well. Typically I don’t care about star ratings, but this one definitely gets five.